We recently did adhesion testing to Corian and Wilsonart surfaces with WEST SYSTEM 105 Resin and 206 Hardener at the request of a composite panel manufacturer. Corian and Wilsonart are mineral filled acrylic panels that look like granite and are often used as countertop material in kitchens and offices. Cabinetmakers and contractors typically use the panels in ½” thickness for residential applications. They are quite heavy, though not nearly as heavy as actual granite. Corian and Wilsonart are similar solid surfaces in that they can both be cut with conventional tools, then wet sanded and polished to a nice shine if they are damaged during installation. They are also available in thinner forms alone, or laminated over pressboard or plywood substrates. We found that WEST SYSTEM Epoxy works well as an adhesive on these materials. The panel manufacturer was hoping our epoxy could be used to adhere the 1/8″ or ¼” thick layers of Corian or Wilsonart to their fiberglass/honeycomb cored panels. They felt that boatbuilders would use more of their composite panels if an adhesive that was already being used in their shops would work for the Corian or Wilsonart panels. Builders could then use the filled acrylic panels to create lightweight counter tops and cabinets that looked like granite for high-end boat interiors. The solid surfaces were sanded dull with 80-grit sandpaper on a random orbital sander. The sandpaper dulled the surfaces quickly with little effort. Each sample was coated with 105 Resin and 206 Hardener prior to applying epoxy thickened with 406 Colloidal Silica filler. 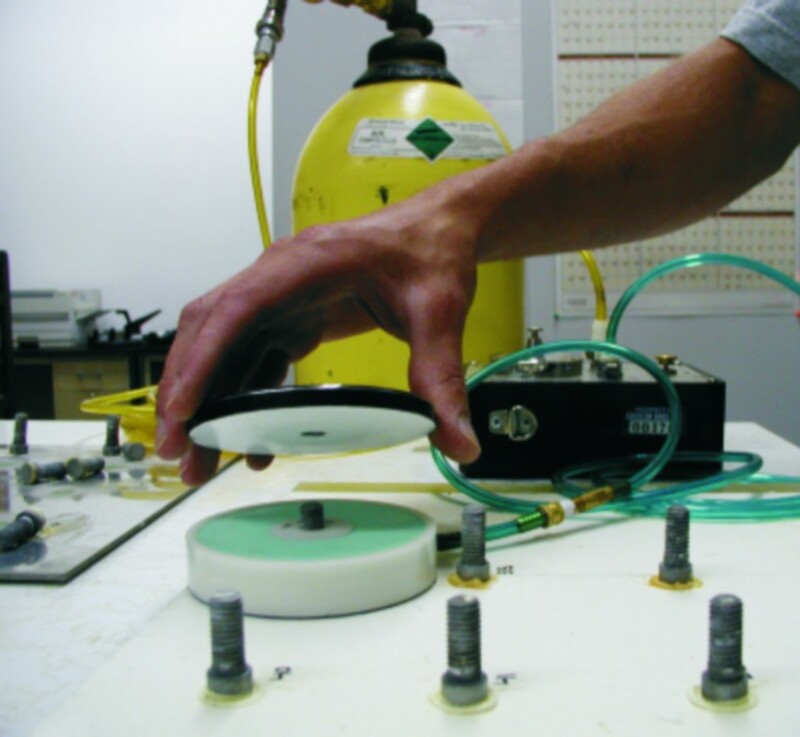 We used the PATTI (Pneumatic Adhesion Tensile Test Instrument) to identify the bond strength of the epoxy to the abraded surfaces (photo). We allowed the test studs to fully cure before pulling with the PATTI. In all cases, the epoxy exceeded the strength of the Wilsonart and Corian materials. Each of the test studs pulled from the surface came away with a piece of the substrate attached to it. The force required to pull the PATTI studs from the ¼”-thick Corian panel averaged 1070 PSI with all of the individual pull tests achieving 100% substrate failure. The force required to pull the PATTI studs from the 1/8″ thick Wilsonart panel averaged 1153 PSI. All individual pulls achieved 100% substrate failure. You should feel comfortable using WEST SYSTEM Epoxy to glue Corian or Wilsonart solid surface materials to your substrate if the surfaces are sanded dull with 80-grit sandpaper prior to applying the epoxy. Having hired a contractor recently for work on my home, I realize how important it is for the contractor and more importantly for me (the customer) that tasks be completed in a timely manner. Keeping that in mind, I thought it would be interesting to test adhesion of G/5 Five-Minute Adhesive to the same Corian and Wilsonart surfaces for situations when a contractor may not need a lot of assembly time or have the time to wait for a long cure. The adhesion testing results for G/5 to 1/4″ thick Corian are impressive. The test duplicated the results achieved with WEST SYSTEM epoxy. Like before, surfaces were prepared by sanding with 80-grit sandpaper. PATTI testing verified that G/5 Adhesive exceeded the tensile strength of the Corian material. Pull off strength averaged over 1000 psi and each PATTI stud lifted a chunk of Corian solid surface attached to it. We often overlook our 5-minute adhesive for household repairs and for general contractor applications because we are familiar with the extended open time and high strength of WEST SYSTEM epoxy. Many times G/5 will suffice nicely for general contracting jobs especially when there isn’t time to wait overnight for glue to cure. G/5 Five-Minute Adhesive is not as strong or water resistant as WEST SYSTEM epoxy. For many tasks, however, we can accept the tradeoffs, knowing that G/5 is stronger than many of the substrates commonly used in home construction. This entry was posted in Home repair, restoration & improvement, Materials Testing, Techniques & Tips and tagged 17, adhesion, Corian, countertops, Epoxyworks #17, Spring 2001, Tom Pawlak, Wilsonart on October 5, 2014 by ewadmin.